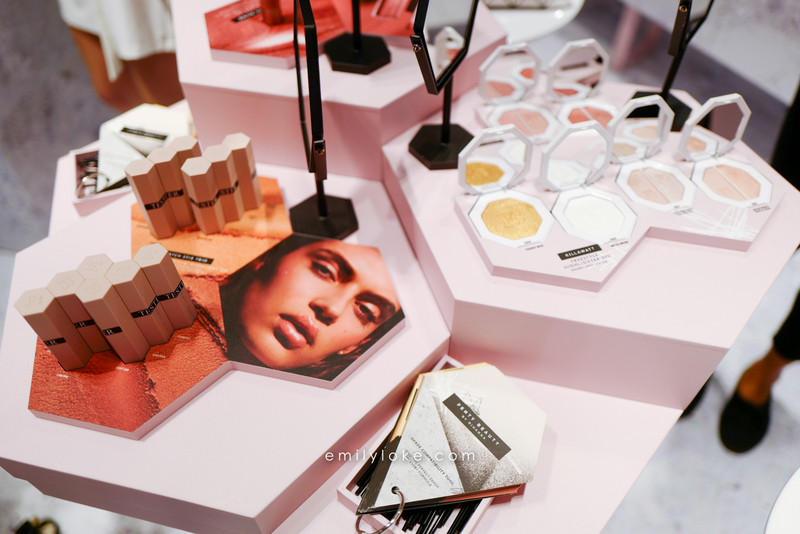 I just got back from the Fenty Beauty launch at Sephora, and thought I’d get some quick and dirty swatch photos up for anyone who hasn’t yet been able to make it down to try the products themselves. Before I get into it, let me just say that I truly loathe over-hyped celeb brands. However, I have to give credit where credit is due: Rihanna did an amazing job with this line, and it’s obvious she put a lot of thought and work and time into the development of each product. From the ultra-inclusive range of foundation (40 shades!) 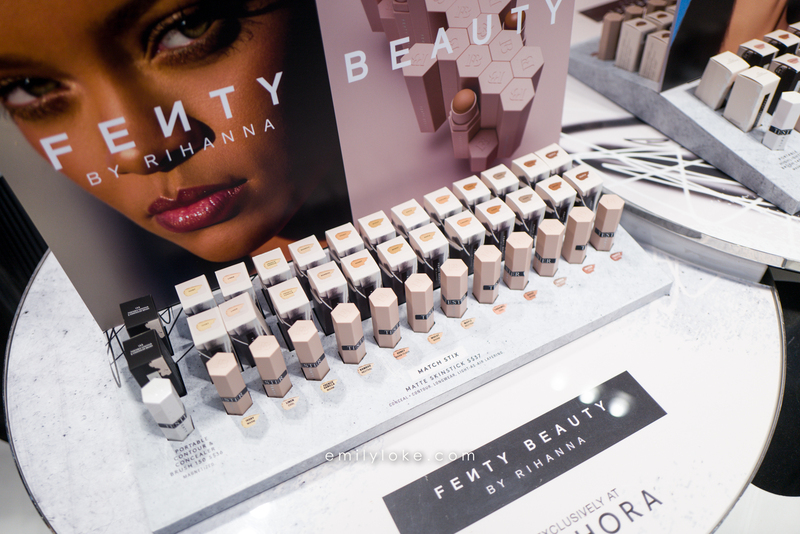 and their genius swatch book system to the thoughtful packaging to the beautiful, beautiful highlighters, you can tell this wasn’t just a line of pre-made makeup that Rihanna slapped her name on. So kudos to you, Riri! I went in today looking for faults but there were none. There were hiccups though. As much as I wish I had been able to swatch and photograph the whole range, it would have been a two person job to do so and get quality photos for my readers…and since there was some awkwardness over me asking if I could have Adam pop in and help me really quickly, I had to pick my battles and focus on just the highlighters. So I apologize for the inconsistent photo quality here and not having the foundation or contour swatches up too. Here are swatches the Killawatt Freestyle Highlighters (click to enlagrge). My first impression was positive. The quality was good on average, but some powders definitely performed better than others. My favourites of the bunch were Metal Moon and the Lightning Dust/Fire Crystal duo. Trophy wife is gorgeously pigmented, but straight up glittery and tough to wear as a highlighter unless you’re looking for pure theatrics. Mean Money was the bottom performer here, lacking pigment and being too sheer. 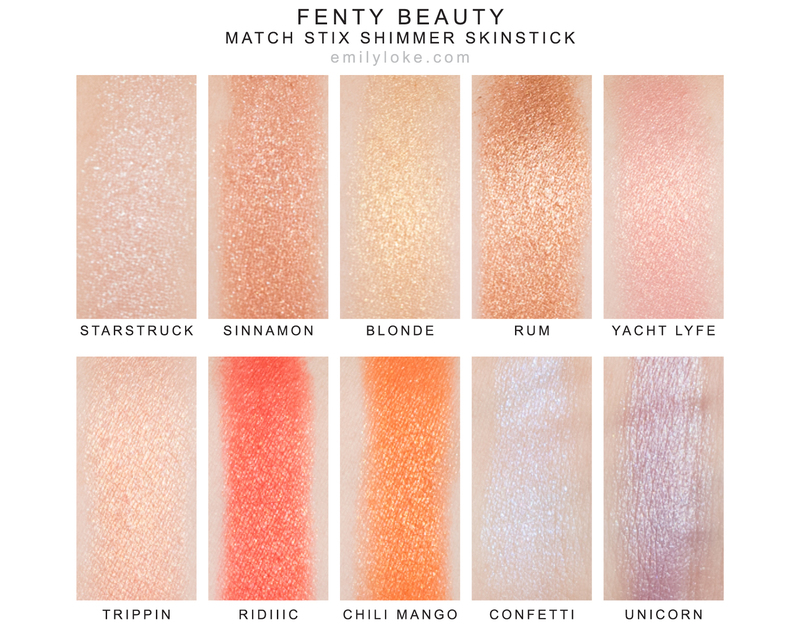 And here are the Match Stix Shimmer Skinsticks. 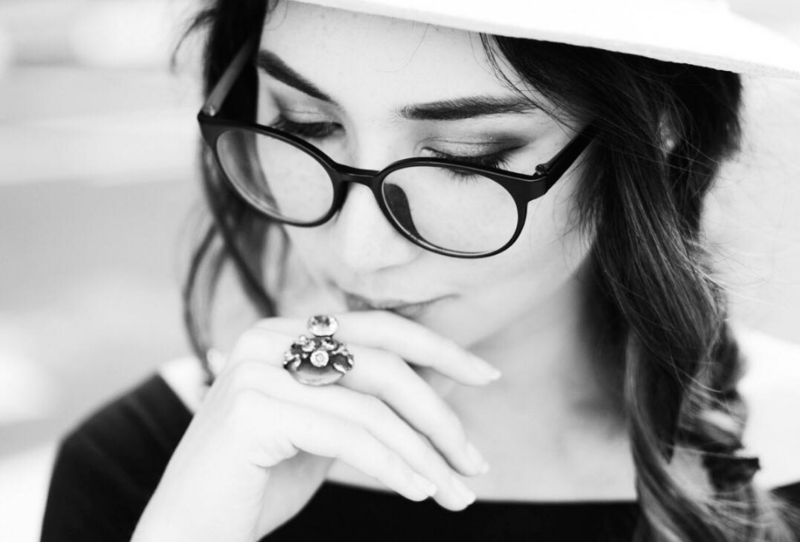 Some were more sheer, some more pigmented, all were consistently smooth and texturally even. No complaints here. My favourites were Confetti and Sinnamon, but really they are all winners. And that’s all she wrote! 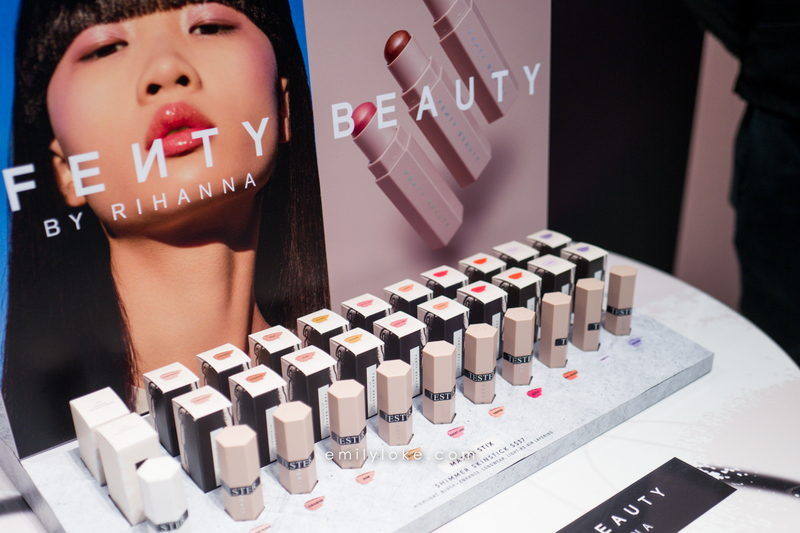 Anything you’re eyeing up from Fenty Beauty? I am usually not too keen on celebrity makeup releases, however, this is one of them that I can’t wait to test! Those swatches look beautiful. One of the thing I’m really impressed is the foundation colour range, not many brands have that big range that could match to everyone’s needs! I agree on all counts. I don’t care for celebrity makeup lines at all, but in my opinion this one could honestly hold its own WITHOUT Rihanna’s endorsement. 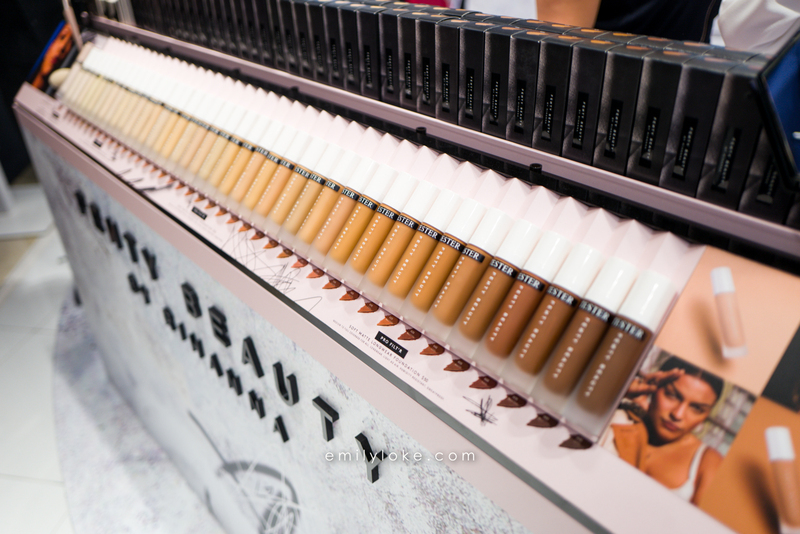 The quality and packaging of the products is great, and the sheer range of foundation colours would have put it on the map…celeb line or not. To me that speaks volumes about how worthy this line is to be taken seriously.